Heirloom tomatoes are old varieties, many of which have been grown for centuries, their seeds passed on from generation to generation. Their superb flavor and unique appearance have brought them renewed popularity. 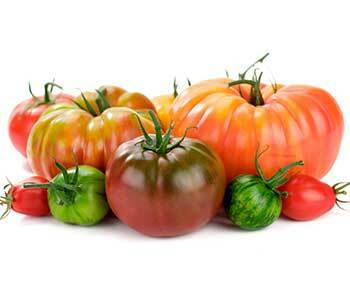 As tomato season approaches look for heirloom varieties in your local nursery or garden center. Look for the letters “VFNT” when choosing a variety. These letters signify that the tomato is disease and nematode resistant. Popular heirloom tomato varieties include Amish legendary beefsteak ‘Brandywine,’ with its creamy, rich flavor; ‘Bulls Heart,’ a Russian variety with excellent, sweet flesh; and purple-red ‘Cherokee Purple.’ ‘Aunt Ruby’s German Green’ is a pale green beefsteak, tinted yellow and pink with spicy flavor. ‘Marvel Stripe’ bears large yellow-orange fruit with sweet red-streaked flesh. So come on down and choose from a variety of heirloom tomatoes starts!